Wahoooooo! … It’s finally finished! I’m actually ready to share my first free gardening eBook with the world. I’m calling it my ‘Introduction To Frugal Gardening’. It’s basically a collection of suggestions, strategies and money saving tips that I’ve pulled together from the last few years. 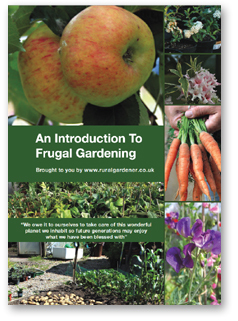 At 25 pages it’s crammed full of useful information for anyone looking to create their own garden paradise, without spending a small fortune along the way! 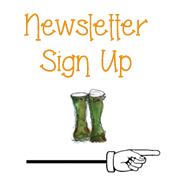 It did take a fair bit of work to prepare and may not be perfect first time round, but I would really value any feedback you’re prepared to offer as I want to write more stuff so others may benefit. If you’d prefer not to then that also fine, in which case please enjoy the content with our best wishes. Oh, and we’ve also been recording a few videos over the weekend you might be interested in. 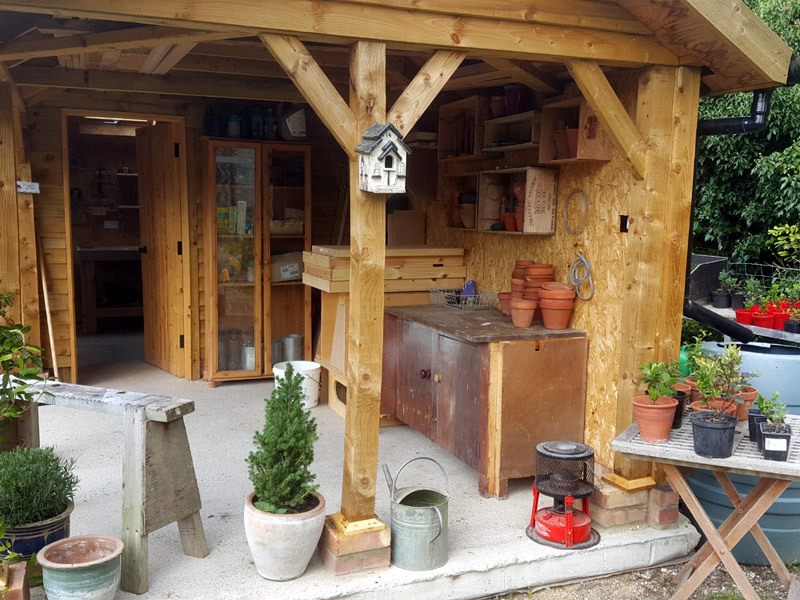 Part 1 explains in some detail how to take softwood cuttings, and how you improve your chances of success. Part 2 introduces the idea of a sand box. Early Spring in the garden at Blackbirds is one of my most favorite times of the year and the garden is already starting to show glimpses of what’s to come. I’ve been working in the garden all week and realised why I love this time of the year so much. It’s all the sounds, as well as the sights that fill the garden at this time of the year that make it so special for me. The birds are busily collecting nesting material, occasionally having a break to take a bath in the wildlife pond we made last year and the plants are beginning to wake up, albeit slowly but wake up they certainly are. A male pheasant that visits the garden most mornings, (affectionately known as Trigger) has started to put on the most amazing dance for the females he’s romancing at the moment. A sure sign Spring is on the way. 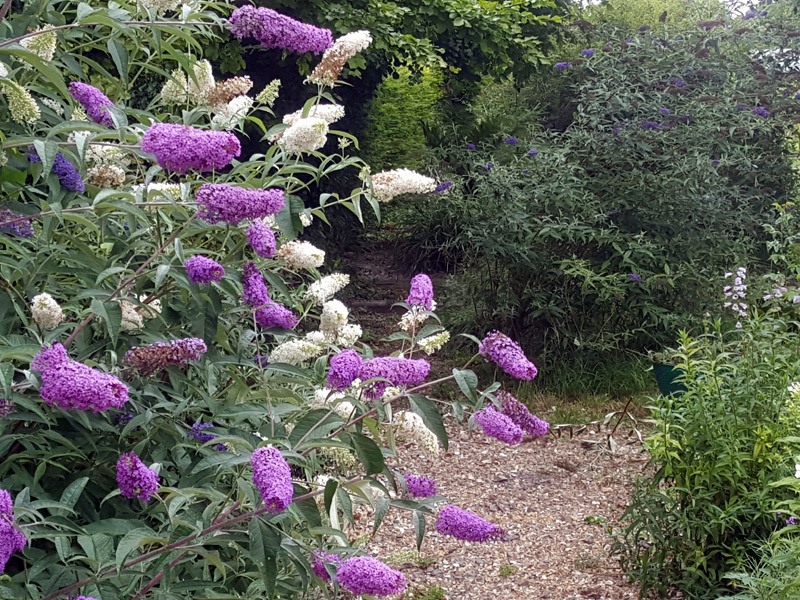 I just thought I’d share some of the wonderful things that are happening in my garden, most of which are happening with little or no help from me. I find that”s the great thing about mother nature, she’ll give you a helping hand whenever she can, just take these little beauties for example. 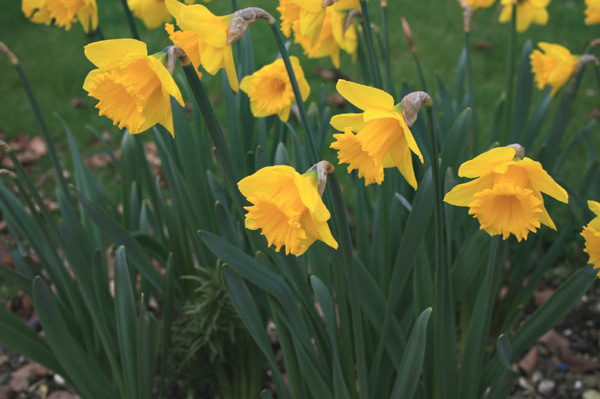 Daffodils are appearing everywhere. I bought a bag for £3.50 from Lidl’s (impulse buy) and planted them in late September wherever I could find a spare piece of soil. Pleased to say they all came up and are looking superb. They made the perfect gift for my mum this Mothers Day. 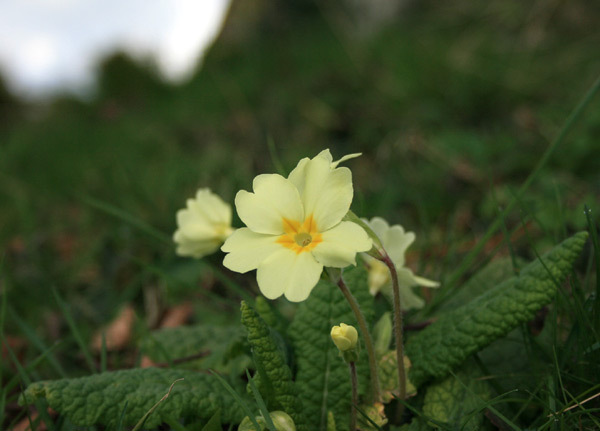 One of my personal favourites of all the Spring flowers are the Primroses. They were growing everywhere when we arrived, but in the last couple of years the numbers seem to have dwindled. Not sure why but I remember my neighbour Jack saying to me when we first arrived, “best leave the first cut of the grass until they have finished flowering Tania “. Perhaps that has something to do with it as I usually give my grass a first cut in early March. This year I’m going to save some seeds and see if I can grow them from seed next year in a bid to return them to their former glory. 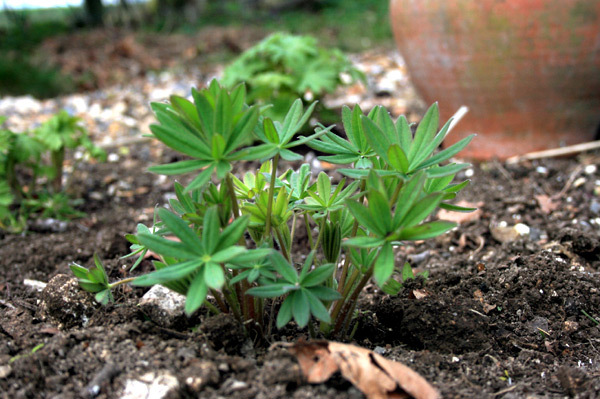 The herbaceous border has just started to kick into life, with the Lupins starting to peak through, along with the Delphiniums. Not sure of the variety, but they seem to like my chalky soil and produce the most gorgeous tall deep blue spires. 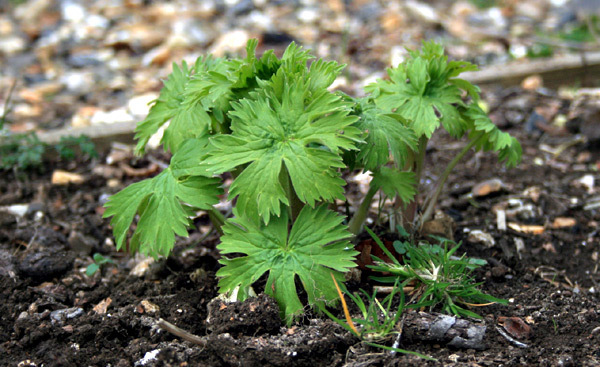 Delphiniums do need additional support to stop them from being blown over by the wind. I tend to use bamboo canes and string. This year I’m going a little more ‘organic’ and make my own herbaceous supports using hazel sticks gathered from the hedge. 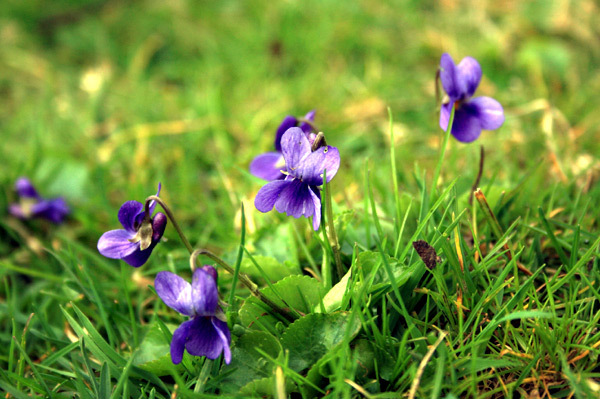 It grows freely along one side of the plot. I like to get my supports in early so I don’t have to worry about damaging the plants when they are in full growth. I plan to create a grid pattern, a bit like a noughts and crosses. I’ll rope John into making a ‘How To’ Video and upload to our YouTube channel in case anyone wants to have a go at making their own. Such a versatile plant hazel, producing catkins in the spring, vibrant green leaves in the summer, and hazel nuts in the autumn, mainly for the local squirrel population I might add! The ‘chucks’ have started to lay a few more eggs, clever girls! We’re getting 2 eggs a day now which I think is down to the warmer weather we’ve had in Hampshire over the last month. 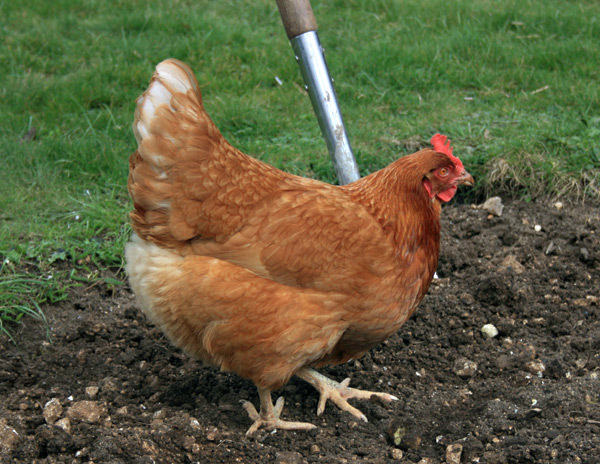 The chickens are so tame now they’re happy to help with the digging ! Last week I spotted the first of the frog spawn in the wildlife pond, which suggests the pond has started to settle down. The water is fairly clear, the oxygenators are growing well and the birds are enjoying their own private bath. 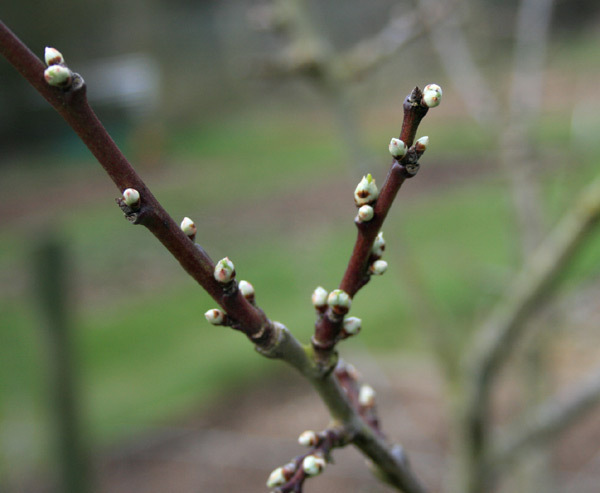 The first of the fruit trees to break bud are the Marjorie’s Seedling Plums, closely followed by the Conference Pears. Hard to imagine these buds will eventually be loaded with gorgeous ripe plums in late summer. The kitchen garden is looking a bit bare with only few leeks left over from last year, but the ground is prepared and in just a few months it should be producing lots of lovely fresh vegetables. The Cut Flower Garden I started a couple of weeks ago is almost ready for planting. 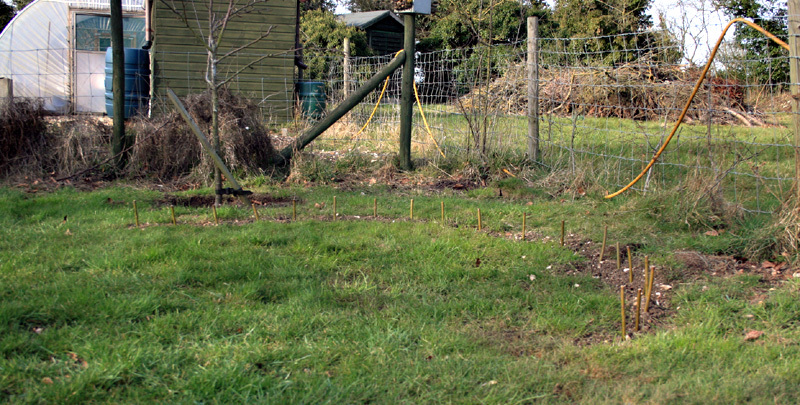 I’m just waiting on a load of compost to be delivered to bring the levels back up. Just can’t believe how many stones are in the ground, and they just keep coming. Last year the local recycling yard was selling a tractor bucket full of well rotted compost for £20 and I’ve been back this year and they’re happy to supply me again for the same price. It’s excellent value for money and by far the best way to buy it. The patio will be filled with perfume soon as the evergreen Clematis Armandiistarts to come into flower. The perfume is superb and it’s a very welcome addition in Spring, and it’s one of the few evergreen clematis. I top dress with a sprinkling of fish blood and bone in late autumn, but I have to say this year it’s looking a bit sorry for itself. Not sure how long they are supposed to last. 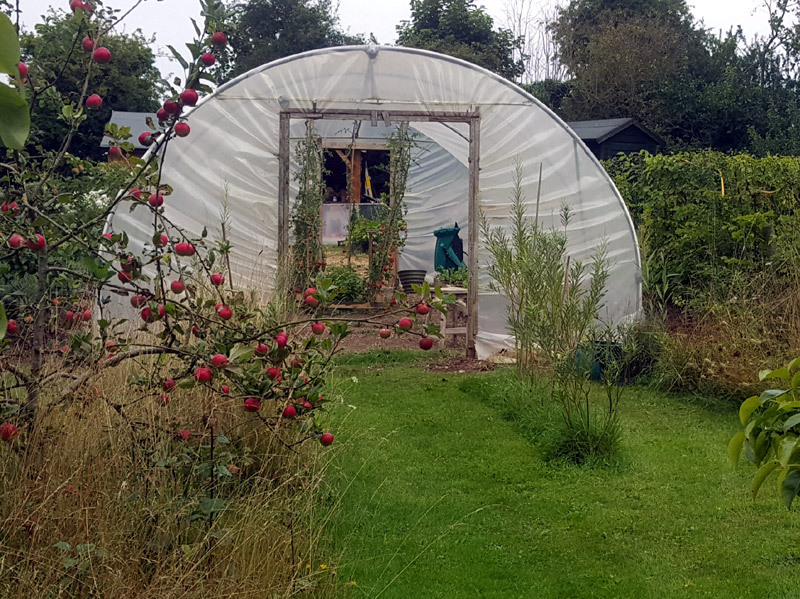 The Polytunnel is starting to come into its own now more than ever. It can be raining all it likes outside, but it’s nice and dry in the tunnel. 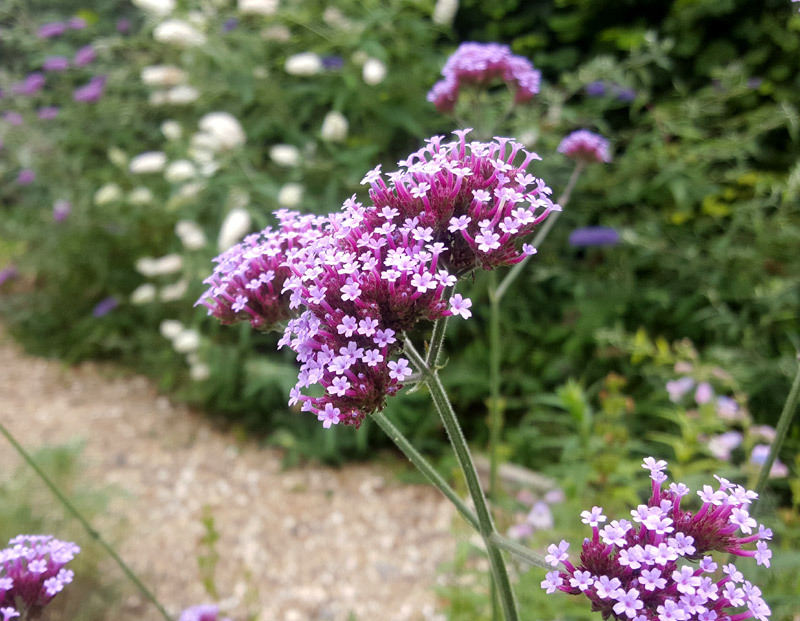 At this time of the year it’s is full of seeds and this year is no exception as there are cut flower seedlings everywhere in preparation for my new cut flower garden project. The compost heap is working hard and I should have a a couple of barrow loads of home grown compost soon, just in time to give the roses a Spring mulch. So that’s a brief round up of Spring in my garden in Hampshire and with April just around the corner there’s lots more to come! 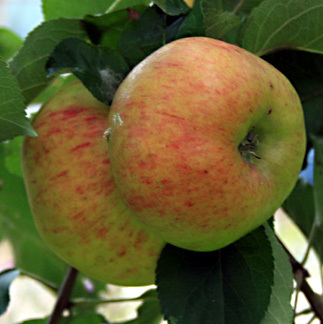 Bramley cooking apples make a great seasonal pudding! It’s been an excellent year in the orchard with pretty much all the fruit trees providing gorgeous fruit. 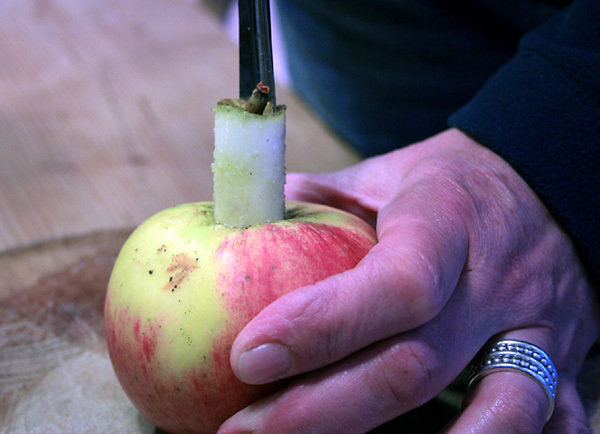 From delicious eating apples, to plums, pears, and super Bramley cooking apples. But I was wondering what to do with my left over Bramleys, other than the usual processing options like purees, pies etc I was a bit stumped. Then I was speaking to a friend at my sewing class and she came up with a great suggestion, which I thought I must share with my readers. It’s simple to make and has a real seasonal flavour, which is perfect with Christmas just around the corner. 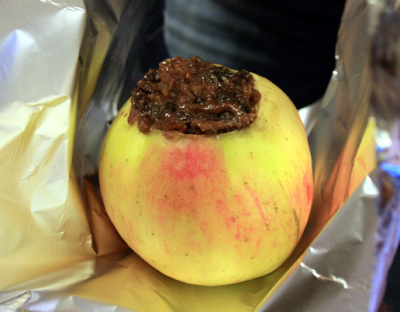 Basically you take a good sized Bramley cooking apple and remove the core. I found it best not to take the whole core out, but leave a small piece at the bottom. I’ll explain why in a sec. 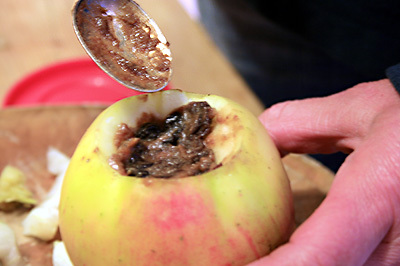 Scoop out some of the apple to leave a good size pocket in the top half of the apple. It’s purely down to personal taste, but I like to sprinkle a little cinnamon powder inside my Bramleys for that special Christmas flavour. Then take a large spoon of fruit mincemeat and stuff it into the hole. Make sure you press it right down to the bottom (which is why we didn’t take all the core out) and remember to leave a little extra on top, as the mincemeat tends to shrink back when it’s cooked. 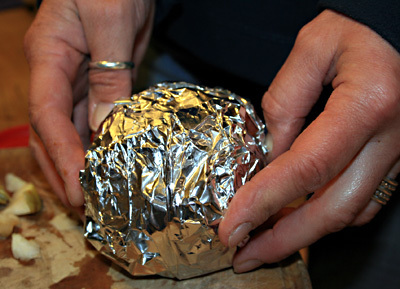 Finally, take a square of tin foil (about double the size of the apple) and wrap the apple in the foil into a neat parcel. Repeat the process for as many apples as you can fit in your freezer and you have the perfect winter pudding! You can cook the apple parcels from frozen, straight out of the freezer. Just put them on a tray into a hot oven, and cook for between 45 mins and an hour, depending on the size. What could be simpler! When they’re cooked, remove the foil and pour over copious amounts of home made custard, or if you’re feeling particularly naughty lashings of cream! If you’d like to keep this post for future reference I have created a PDF. It’s absolutely free, so please feel free to download as many times as you like, with my best wishes. Another productive weekend in the garden, mostly spent in the kitchen garden planting two rows of my early pea crop (Kelvedon Wonder), along with a row of quick cropping carrots (Nantes). I also managed to plant a some Boltardy beetroot on modules in the Polytunnel. 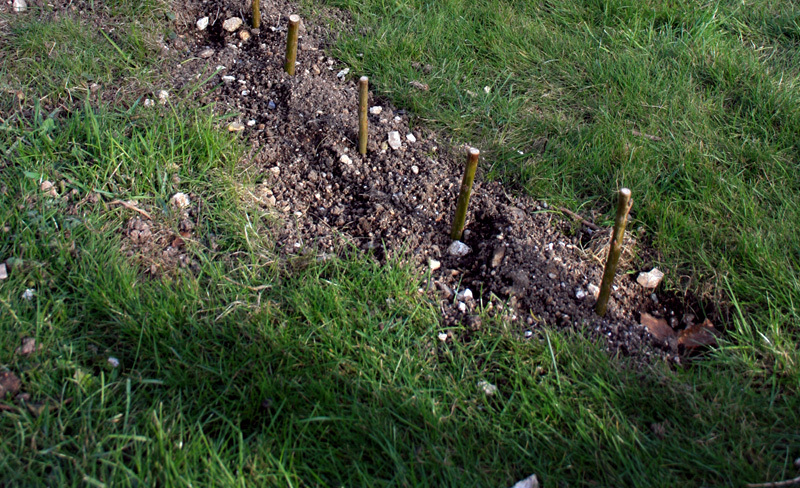 I saw Monty plant his the same way in last weeks Gardeners World so I thought I’d give it a go. 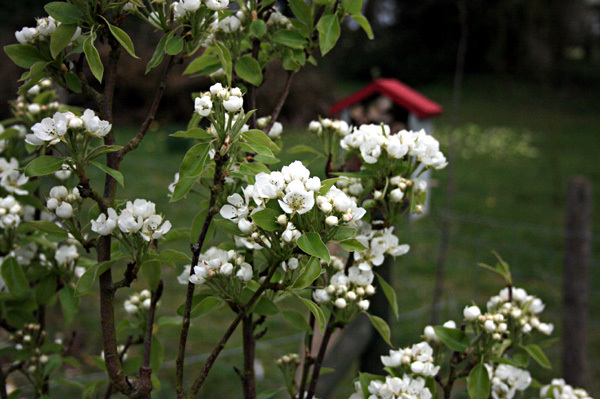 The first of the fruit trees to blossom in my garden are my two Pear trees, Conference Pear and Doyenne De Comerce, and what a wonderful display they make on a beautiful Spring day! I just hope they manage to hold onto the fruit this year as last year they all dropped off before they had a chance to grow. I’ve absolutely no idea why, so if anyone has any idea why I’d love to know. 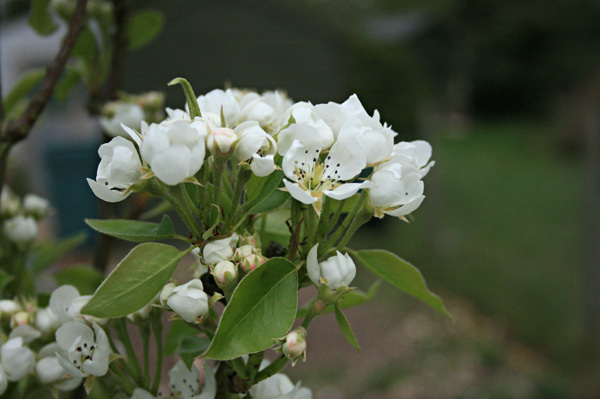 SPRING APPLE BLOSSOM, JUST GORGEOUS! 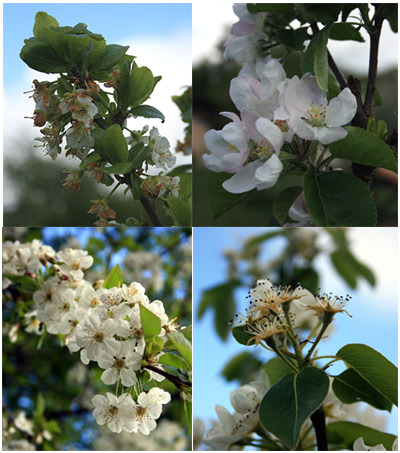 I always look forward to the May bank holiday weekend as it’s probably the best weekend for blossom. These are four of my favorites, Plum, Apple, Pear and Cherry. The cherry grows wild in the hedgerows around Blackbirds. 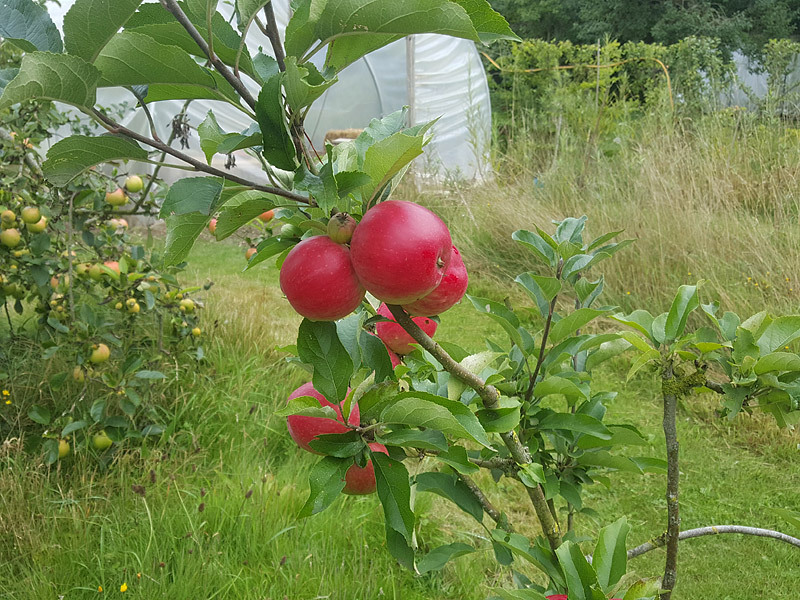 As the weather is so mild we stand a good chance of a bumper harvest in the orchard.